The city grew slowly from about 800 residents in 1590, to almost 10,000 by the 1890s, but most of this population growth took place in the 19th century. It benefited initially from the growth of bananas for export in the 1870s and 1880s and formed a close relationship with US-based shipper and railroad entrepreneur Samuel Zemurray's Cuyamel Fruit Company, and the construction of the Interoceanic Railroad between 1869 and 1874 which connected the city to the coast at Puerto Cortés. Zemurray worked closely with local elites who invested in subsidiary enterprises and thus shaped the way politically for Cuyamel to establish himself and, along the way to pay very few taxes. Panoramic view of Downtown San Pedro Sula. In 2013, fifteen years after the effects of Hurricane Mitch, Honduras is one of the poorest countries in Latin America; around San Pedro Sula, banana production has not fully recovered, and "manufacturing has all but dried up." The problems are exacerbated by organised crime, whose rules prevent residents from safely leaving gang-controlled neighbourhoods such as Chamelecón for jobs in other parts of town. In 2000, then-Mayor Roberto Larios Silva said "San Pedro Sula is where the economic development of the country is concentrated via the city's industrial, commercial and financial development." The then-manager of Hotel Copantl attributed its growth in business-related tourism ...[to] the maquila (apparel manufacturing) industry. As of 2011[update], San Pedro Sula generated two-thirds of the country's gross domestic product (GDP). San Pedro Sula was the "murder capital of the world" until early 2016 when Caracas, Venezuela, surpassed its homicide rate. Since the 2009 Honduran military coup "unemployment and underemployment rates have doubled while the number of people living in extreme poverty has skyrocketed." In 2013, the city had 187 homicides per 100,000 residents. This surpassed Ciudad Juarez, Mexico's rate of 148 killings per 100,000, or an average of about three homicides per day; Ciudad Juarez had previously topped the list for three consecutive years. Both cities are major operational and strategic distribution points in the illegal drug trade, particularly to the United States, and have significant gang activity. In response, authorities launched Operation Lightning, saturating violence hotspots with police and soldiers. Meanwhile, arms trafficking has flooded the country, with just under 70% of all firearms being illegal. 83% of homicides in the city involve firearms. 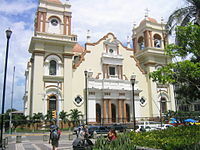 San Pedro Sula features a tropical savanna climate (Koppen Aw), with year-round relatively high temperatures and plentiful rainfall year-round. San Pedro Sula has experienced hurricanes and tropical storms and is prone to them during the hurricane season usually when the storms form in the southern part of the Caribbean or Western Africa. 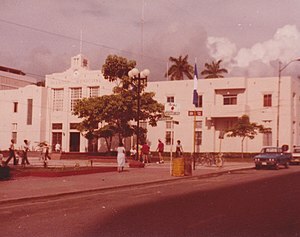 San Pedro Sula's Old Train Station. San Pedro Sula, as most cities built under the Spanish colonial period, is divided in quadrants. Avenues in the city run from north to south and streets run from east to west. First Street and First Avenue mark the "center of the city" and effectively divide it into four major quadrants NW, NE, SW and SE. Barrio El Benque, the business district, is just to the west and south of the centre, and other neighbourhoods in the suroeste include Barrio Paz Barahona, Barrio La Guardia, Colonia Altamira, Colonia Mesetas, Barrio Rio de Piedras, Barrio Suyapa (from 12 Avenida S out to Avenida Circunvalacion, from 7 Calle S to 10 Calles S), Colonia Hernadez, Barrio Prado Alto, and Colonia El Chamelecón. The latter includes area from 23 Avenida S west to 27 Avenida S, from 1 Calle (named Bulevar Los Proceres there) south to 5 Calle S0. To the south of Colonia El Chamelecón are Colonia Dubon, Colonia Figueroa, Colonia Trejo (from 10 Calle S to 12 Calle S, from about Avenida Circunvalacion to 25 Avenida S, including the Consulate of Nicaragua), Colonia Altamira, and Colonia Altiplano. Colonia Las Mesetas runs from 12 Calle S to 14 Calle S, from 21 Avenida A (S) to past 24 Avenida S.
Barrio Guamalito is just to the west and north of the centre. Noroeste neighbourhoods include Colonia Moderna (from 1 Calle to 5 Calle NO, from Avendia Circunvalacion to the rio beyond 24 Avenida), Colonia La Mora (from 5 Calle NO to 7 Calle No, from Avendia Circunvalacion to the rio beyond 24 Avenida), Colonia Zeron, the Colonia Columbia by the Universidad de San Pedro Sula, Barrio La Cerveceria and Barrio Guadalupe. Across the Rio along which 24 Avenida runs is Colonia Juan Lindo and Colonia Jardines Del Valle. From the river past 24 Avenida, north to 25 Calle and west to 12 Avenida, is Colonia Universidad. Universidad de San Pedro Sula is to its south, across the river. West of Colonia Universidad is Colonia Country, a small neighbourhood including the Academia Americana, and Colonia Villas del Sol, which runs from Boulevard Mackey west to include Universidad Nacional Autonoma de Honduras en el Valle de Sula, and goes north to Rio Bermejo but does not cross it. Just past the Universidad Nacional Autonoma de Honduras en el Valle de Sula, and spanning the Rio Bermejo, is Colonia El Pedregal, which has residential high-rises. Further out, north across the Rio Bermejo, running to the edge of the city, and with Calles (streets) renumbering from 1 up, are Colonia Los Alpes and Rancho El Coco and Residencial Los Cedros and Colonia La Tara. Far to the north is Colonia Fesitranh. Barrio Las Acacias is just to the north of centre. Nor-Este neighbourhoods include Barrio San Cristobal, Villa Florencia, Colonia Ideal, Barrio Morazon, Colonia Modelo, and further out Colonia Bogran, Colonia El Carmen, and Colonia Los Laureles. Includes the road to the airport, Aeropuerto Internacional Ramon Villeda Morales and to the city of La Lima. Southeast neighbourhoods include Barrio Medina (11 Calle SE to Avenida Juan Pablo II, 4 Avenida SO to 10 Avenida SE), Colonia La Aurora (defined by 7 Calle SE to 10 Calle SE, and 14 Avenida SE to Segundo Anilo (approximately where 18 Avenida would be), Barrio Cabañas, Barrio La Navidad, San Pedro, Barrio Las Palmas, Barrio La Navidad, Barrio San Luis, Colonia La Union, Barrio La Paz. Farther out: Colonia Rivera Hernandez, San Cristobal. With dateline giving San Pedro Sula as the location, the New York Times in 2014 described the Chamelecón district as a "warren of modest cement-block houses painted in now chipped and fading pastels", subject to pressure of street gangs. This is not the Colonia El Chamelecón neighbourhood within San Pedro Sula, but rather it is the Chamelecón that lies outside to the south of San Pedro Sula, on the Chamelecón River. The Villa Olímpica is a multi-sporting complex that has facilities for most Olympic style games including football, boxing, swimming, baseball, cycling and multipurpose gymnasiums. San Pedro Sula is the only city in the country to be home to two football stadiums. The Estadio Olímpico Metropolitano is located in the Villa Olímpica and is the largest in the country with a capacity of 42,000. The Estadio Francisco Morazán is located in the centre of the city and holds 23,000 people. The stadiums are home to San Pedro Sula's most popular professional football teams Marathón and Real CD España. As of 2009[update], San Pedro Sula has been the home venue for Honduras national football team matches. San Pedro Sula's municipal palace. It has a Catholic cathedral that was built in 1949. as well as a Greek Orthodox cathedral, Iglesia Ortodoxa de Antioquía San Juan Bautista, built in 1963. ^ "Distrito central: Informacion del municipio". XVII Censo de Población y VI de Vivienda 2013. Retrieved 30 July 2016. ^ "Honduras: metropolitan areas". World Gazeteer. Retrieved 24 February 2010. ^ Dario Euraque, Reinterperting the Banana Republic: Region and State in Honduras, 1870–1972 (Chapel Hill, North Carolina: University of North Carolina Press, 1996) pp. 25–27. ^ a b c d e Wilkinson, Tracy. "In Honduras, rival gangs keep a death grip on San Pedro Sula". Los Angeles Times. Retrieved 17 December 2013. ^ "San Pedro Sula becomes popular convention destination". Special International Report. The Washington Times Advertising Department. 24 March 2000. Archived from the original on 23 August 2001. Retrieved 17 December 2013. ^ "Honduras's indebted economy: The cost of a coup". The Economist. The Economist Newspaper Limited. 399 (8737): 71. 11–17 June 2011. Retrieved 17 December 2013. The country of 8m is fighting back hard against its "unjust strangulation by the rest of the world", says Luis Larach, head of the chamber of commerce in San Pedro Sula, a northern export powerhouse that generates two-thirds of the country's GDP. ^ a b "Honduran City is World Murder Capital; Juarez Drops for Second Year in a Row". Fox News Latino. 8 February 2013. Retrieved 30 April 2013. ^ a b Cabrera, Jorge (5 April 2013). "Life and death in the murder capital". Reuters. Retrieved 30 April 2013. ^ a b c Romo, Rafael; Thompson, Nick (28 March 2013). "Inside San Pedro Sula, the 'murder capital' of the world". CNN. Retrieved 30 April 2013. ^ Kuruvilla, Carol (30 March 2013). 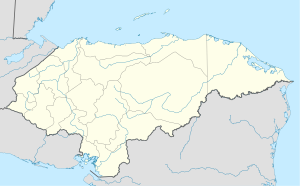 "San Pedro Sula in northwest Honduras is the murder capital of the world: report". New York Daily News. Retrieved 30 April 2013. ^ "Most Dangerous Cities in the World". worldatlas. 2 March 2016. Retrieved 8 May 2016. ^ Sterbenz, Christina (31 December 2014). "San Pedro Sula, Honduras is the world's most violent place". Business Insider. Retrieved 31 December 2014. ^ a b Miroff, Nick (13 January 2012). "San Pedro Sula, Honduras is the world's most violent place". The Washington Post. Retrieved 30 April 2013. ^ Romo, Rafael (28 March 2013). "Inside San Pedro Sula, 'murder capital of the world". CNN.com. ^ Gardner, David (29 April 2013). "Inside the most violent city in the world: Horrific collection of photos show grim reality of life in San Pedro Sula, Honduras". Daily Mail. Retrieved 30 April 2013. ^ Miroff, Nick (8 March 2012). "Grim toll as cocaine trade expands in Honduras". The Washington Post. ^ "La Mesa Climate Normals 1961–1990". National Oceanic and Atmospheric Administration. Retrieved 24 January 2016. ^ "Klimatafel von San Pedro Sula (La Mesa) , Bez.Cortés / Honduras" (PDF). Baseline climate means (1961–1990) from stations all over the world (in German). Deutscher Wetterdienst. Retrieved 24 January 2016. ^ "Station La Mesa" (in French). Meteo Climat. Retrieved 12 June 2016. ^ Fiallos, Maria (2 January 2009). Honduras and the Bay Islands Adventure Guide. Edison, NJ: Hunter Publishing, Inc. Retrieved 1 July 2012. ^ Randal C. Archibold (2 August 2014). "Hope Dwindles for Hondurans Living in Peril". New York Times. ^ "El año 2009 será duro" [The year 2009 will be hard]. Diario La Prensa (in Spanish). Archived from the original on 12 December 2008. ^ "Introducing San Pedro Sula". Lonely Planet. Retrieved 9 April 2015. Wikimedia Commons has media related to San Pedro Sula.